September is Dementia Awareness Month, an important initiative providing Australians with further knowledge and understanding of how dementia affects individuals, their families and carers. The theme for this year is ‘You are not alone’; a sentiment that aims to help those impacted to feel supported and empowered even in difficult circumstances. Dedicating their time and energy to raising awareness of the topic of ageing grandparents or other family members is a passionate group of Australian children’s authors and illustrators. Their personal, heartfelt stories of hope and compassion continue to provide encouragement, optimism and inspiration to many children and families confronting change and illness in the ones they love. Debra Tidball‘s When I see Grandma fits perfectly with the theme of ‘You are not alone’ on several levels. It is a poignant story of a little girl who brightens the dreams of her grandmother in an Aged Care Home. With gorgeously illuminating illustrations by Leigh Hedstrom, this book includes both heartwarming and practical strategies for creating, and rekindling fond memories. More on the book and a Boomerang Books interview with Debra Tidball can be found here. In a recent article, Debra provides enlightening guidance for children and parents on reading to grandparents. Find it on the Wombat Books blog here. Ellie explains the power of listening. 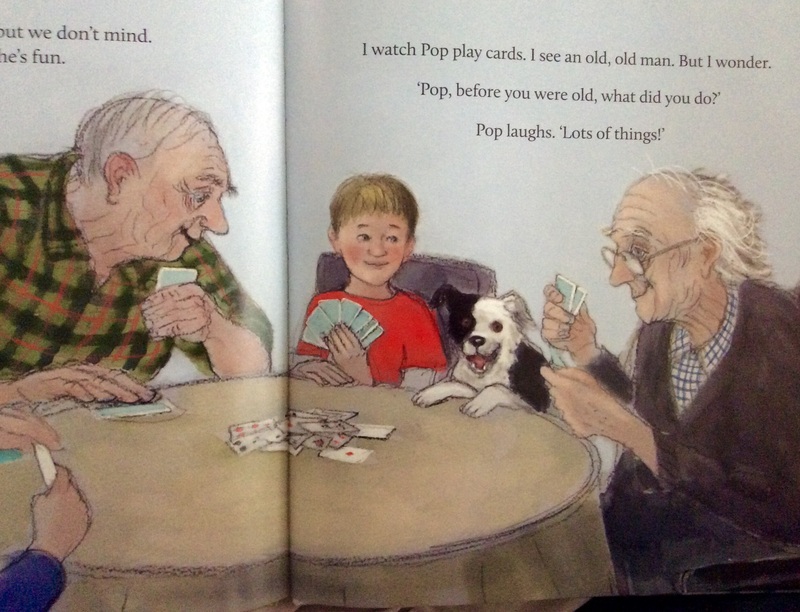 “As a picture book about older people’s stories, it [Lucas and Jack] encourages the listening which often leads to such enriching connections being formed.” Read the full article here. More on Ellie Royce’s book and a Boomerang Books interview is here. Working Title Press, June 2014. 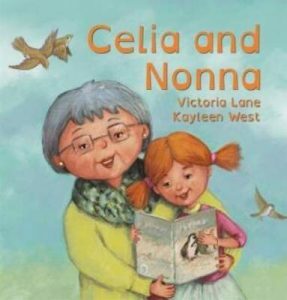 Victoria Lane (Thieberger) is the author of Celia and Nonna, with timeless illustrations by Kayleen West. This gentle book embraces the hard realities of dementia and adapting to change, but at the same time highlights strength, togetherness and faith in the ones we love. The full review and Boomerang Books interview with Victoria Lane is here. Ford Street Publishing, September 2014. Do You Remember? 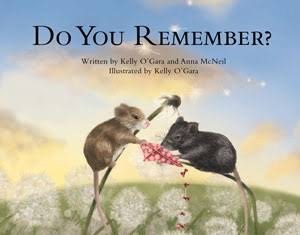 by Kelly O’Gara and Anna McNeil is a comforting, poignant story of memory and togetherness of a mouse and her grandmother. The celebration and the gradual fading of those memories are gently portrayed using the child’s artwork as a medium to remind her grandmother of her own rich and wonderful stories. 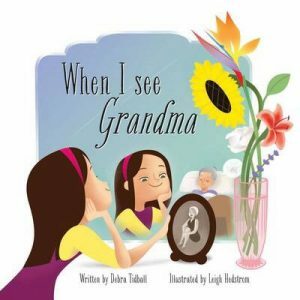 This book shows a beautiful way to support and encourage children and their elderly grandparents to preserve and strengthen their bonds. Harry Helps Grandpa Remember, authored by Karen Tyrrell, and illustrated by Aaron Pocock, is a story of compassion, humour and hope. 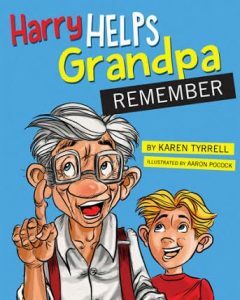 Young Harry provides a forgetful, confused and lost Grandpa with cleverly integrated coping and memory skills. Here is a book that gently introduces “children to the realities of Dementia and Alzheimer’s.” Find out more about the book here. Digital Future Press, April 2015. Alzheimer’s Australia also has resources to help provide reassurance to families. 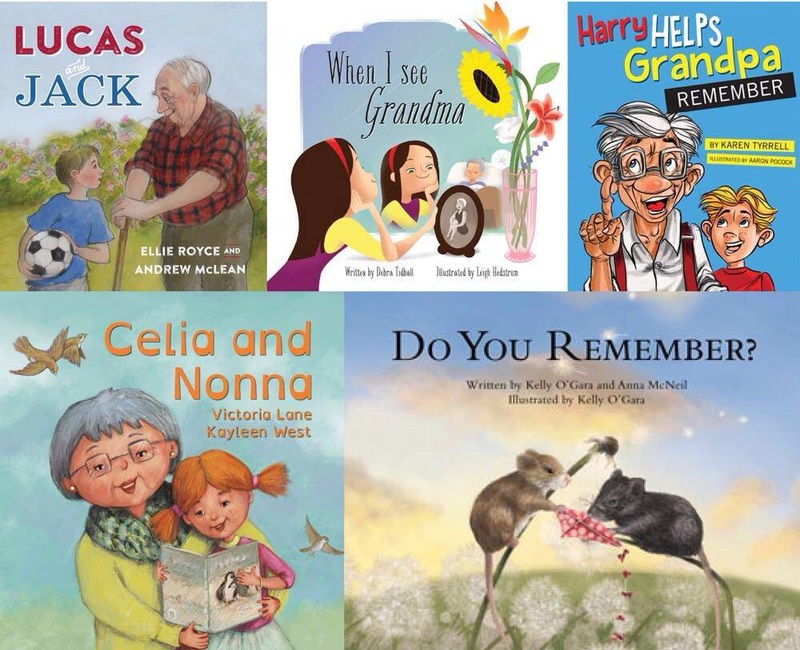 Another website to explore is Dementia in my Family, where you can find most of the above picture books listed in the resources section. Click here for more information on dementia and loneliness. Along with a staunch group of Australian literary professionals, Ellie Royce is a strong advocate for promoting encouragement for families to connect with older generations, share love and facilitate the power of memory. Her latest picture book is one in a line up, not only involved in initiatives to create awareness of ageing people and dementia (Dementia Awareness Month), but also as a nominee for a prestigious award. 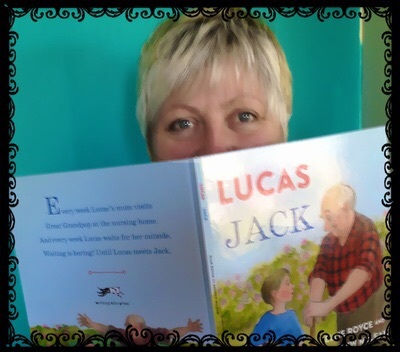 Find out more about her gorgeous book, ‘Lucas and Jack’ and her significant contribution to the community in our captivating interview! I love Ellie Royce‘s passion for writing and the power of words. Combined with her absolute dedication to working with the elderly, her first picture book, ‘Lucas and Jack’ is a notable example of an award-winning piece of literature. With its delicate, picturesque style charcoal and watercolour illustrations by Andrew McLean, and gentle, endearing story, ‘Lucas and Jack’ represents connection, value and affection. The intergenerational bond between a young boy and his Great Grandpop is tightened after forming a relationship with another resident at the nursing home; Jack. When Lucas waits alone for the visit to end, it is Jack’s presence that ultimately gives Lucas the gifts of perspective, curiosity and appreciation. Jack is able to open Lucas’s eyes to the once beautiful and intriguing pasts of other elderly people, including detective Leo, ballerina star, Evelyn, and himself as a young farmer. His Pop may be wrinkled, old and frail, but with Lucas’s newfound regard he sees a once hard-working ice delivery boy. Now Lucas will have to wait until his next visit to find out more about Pop’s childhood adventures. 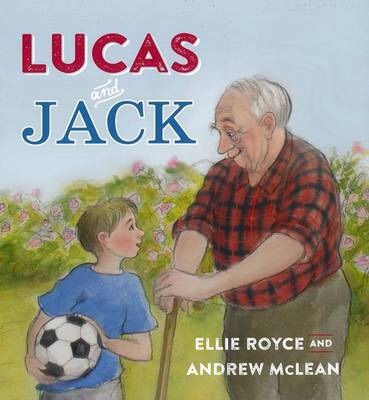 ‘Lucas and Jack’ drives home the importance of engaging with and being empathetic to our ageing loved ones, particularly at difficult and confusing times. Royce cleverly integrates charming dialogue with prompts for readers to investigate the life stories of, and form further attachments with their own grandparents and great-grandparents. This heartfelt tale is a valuable addition to any home or classroom setting. A sincere delight! Congratulations on your first picture book, ‘Lucas and Jack’ being shortlisted in the Speech Pathology Australia Book of the Year Awards! What does this honour mean to you? Thank you! I was so excited to hear that “Lucas and Jack” was a shortlisted book for this award. I am thrilled to have been able to collaborate with a gifted illustrator like Andrew McLean and I understand that a “picture” book is very much like a jigsaw puzzle as in all the pieces both text and illustrations are vital in telling the story so neither one is more important or works without the other BUT…. I have to admit I am a word geek. I adore words, I adore learning new and old words, making up words, reading and writing with them, sharing them, playing with them. So for me, having a story shortlisted which promotes literacy and speech is a massive honour, a truly magical experience. As an author who works in an aged care facility I was inspired by the fascinating life stories of my residents. I see their photos of them as dashing young things and hear their stories on a daily basis and it really fires my imagination! So often we make a presumption about people based on what they look like – in the case of “Lucas and Jack” it’s older people but this also applies to people with disabilities and people of other ethnic backgrounds- the list goes on. I would often see residents’ younger visitors hanging around outside, not engaging or interacting with their relatives because all they could see was what was on the outside, the wrinkles, the hearing aid, the wheelchair and the gap seemingly too wide to be able to connect. “Lucas and Jack” simply shows that each of us has at least ONE thing in common- we were all young once. Also that if we share our stories we can find connection with each other. The characters in “Lucas and Jack” were inspired by real residents, some of whom have now passed away. It’s been a real thrill for their families to have this book to share with their grandchildren and great grandchildren, keeping family history and family stories alive. It’s been a real thrill for me to be able to create that opportunity for them. You are an active member in the aged care community. Can you tell us a bit about the work you do for the elderly? I’ve worked in aged care for almost ten years. For five of them I was the person who received that first phone call “I need help to find out about aged care, Mum/Dad/I have been told I can’t stay at home anymore” or variations on that theme. What a privilege to have a job where you can help people who are confused, frightened, grieving and feeling so many other emotions! My day was made when someone left my office saying “Thank you, now I understand how it all works. I’m so relieved.” As a communicator, there’s almost nothing better. When I say almost though, I have to say that the role I have now which is Communications Coordinator and engagement officer where I run our newsletter, website and social media outlets and liaise closely with our Lifestyle team to source and develop projects which allow our residents to connect with community, participate in arts and creative experiences that engage and inspire like storytelling (funny about that! ), art exhibitions and intergenerational groups as well as running arts based programmes for our dementia specific residents to find out which strategies enhance their quality of life is the “dream job.” The only thing that could top it is if I were a full time author. But even then, I think I’d miss the day job, it’s such a rewarding and exciting area to be involved in. A tiny vignette of my day springs to mind where recently I was able to facilitate access to audio downloads of classic books for a very academic and bright lady who is confined to bed, unable to move or verbally communicate easily. When she heard the first words of “Pride and Prejudice” the look of pleasure on her face brought tears to my eyes. It’s a small thing to us, but to her it is her whole world. Again, what a privilege! ‘Lucas and Jack’ emanates a beautiful message of celebrating and cherishing the ‘stories’ of elderly people and forming bonds with grandparents. What do you intend your readers to gain from engaging with your book? I would love to see “Lucas and Jack” of course offering a good read, an enjoyable experience. But also I hope that the book will pave the way for the readers to share their own stories. 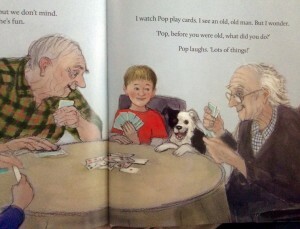 I would love to think that after reading “Lucas and Jack” a young person will look at an older person, frown, wonder and ask the question “What did YOU do before you were old?” or “What was it like when you were a kid? Did you do the same stuff as me? What games did you like? What was school like?” and the floodgates of sharing, laughing, crying, remembering, honouring and connecting will open. Because stories aren’t just stories are they? They’re bridges to things and ideas like empathy, literacy, resilience, imagination and perhaps most important of all in today’s world they are bridges BETWEEN things and people who think they are too different to ever be able to connect. There’s a great quote by Roslyn Bresnick-Perry “It’s hard to hate anyone whose story you know.” I hope “Lucas and Jack” builds bridges between people. The sense of nostalgia and livelihood in ‘Lucas and Jack’ are expertly and gently portrayed in the illustrations by award winning illustrator Andrew McLean. How do feel his pictures best compliment your words? What was it like to collaborate with him? Oh my goodness how does one express what a magical experience it is for your words to inspire such incredible responses from an illustrator? It really did feel like magic, watching the development from his roughs (ha, roughs? I couldn’t believe he called them roughs; they were gorgeous!) Perhaps that’s another reason why I love the picture book form so much. They are such evocative and beautiful images that resonate so much with everyone who sees the book. I was incredibly lucky to work with Andrew. World Dementia Awareness Month is held throughout September. Please explain the purpose of this initiative and how you are participating in raising its awareness to the public. This year’s theme is “I Remember”. I’m excited to be collaborating with a fabulous group of Australian creators, both authors and illustrators to showcase their books about ageing and dementia for September’s World Dementia Month. The helplessness and confusion a growing number of children face when confronted with the decline of an elderly relative prompted these local literary professionals to create stories to provide encouragement and hope to families. Each of the unique and beautifully illustrated stories is based on personal experience and offers practical strategies to connect and share love with elderly grandparents even in difficult, changing, and confusing circumstances. The power of memory and remembering as a way to sustain a loving connection is a common thread and ties in perfectly with the “I Remember” theme for 2015. Along with “Lucas and Jack” we have Celia and Nonna (Victoria Lane and Kayleen West, Ford Street Publishing) where Celia brings memories of happy times spent together with her grandmother into Nonna’s new aged care home by making pictures and paintings to fill the walls. The grandchild mouse in Do You Remember? (Kelly O’ Gara and Anna Mc Neil, Wombat Books) uses artwork to honour Grandma’s memories. In When I See Grandma (Debra Tidball and Leigh Hedstrom, Wombat Books) Grandma’s memories are brought to life through her dreams as the granddaughter shares with her everyday things she enjoys doing and in Harry Helps Grandpa Remember, (Karen Tyrrell and Aaron Pocock) Harry shares coping skills to help his grandpa boost his memory and confidence. These stories are humorous, at times poignant and always heartfelt. Our hope is that they will inspire and encourage children and families who are grappling with change and illness in those they love. You write in a range of genres, including children’s and young adult books. Do you have a preferred genre? What do you love about writing for younger children? I would have to say that I really, really love the picture book art form. I believe stories can change the world, I truly believe this and one of the most marvellous manifestations of story for me is the picture book. It can encompass any concept no matter how complex in a simple way. It is possibly the purest essence of story and if you want o know why, try telling a really good story in 495 words! It also speaks to both sides of our brain, with text and illustration. I have two daughters, one who is a language child and one who is a visual. Picture books were the bridge between their learning styles which gave us the opportunity to share so many wonderful experiences as a family. Because it speaks symbolically through pictures as well as through words, a picture book resonates within our souls, speaks to our conscious and unconscious mind and stays with us in ways that other forms of story don’t. Younger children really ‘get’ this. They enter into the storytelling experience and totally become one with the story. It’s a beautiful thing! Besides writing, what other pastimes do you enjoy? I love art and photography, to read, listen to music, work in my vegie garden, cook (then eat), sit around and yak with my daughters, spend time at the beach, to rummage for vintage treasures and to laugh. Laughing is good. What were your favourite books to read as a child? Any that have influenced you as a writer? I find that everything I have ever read sometimes pops up to surprise me as a writer! I suppose the most important influence is that I aspire to create the same magic for my readers that I experienced (and still do). One of my favourite books was and still is “The Phantom Tollbooth” by Norton Juster. In fact I recently read it again and every word still fills me with pure crystalline joy. It is an exemplary, beautiful piece of writing. It’s delicious and joyous and fun. I was an Enid Blyton child from day dot. I loved Pip the Pixie, Mister Pinkwhistle , The Magic Faraway Tree (er yes I am rather old hahaha!) followed by Famous Five, Secret Seven and then the boarding school books. I also loved everything Roald Dahl wrote and CS Lewis’ “Narnia” series. How can I pick just one? Alice in Wonderland, The Hobbit, Peter Pan! I also loved “The Railway Children” by Edith Nesbit, “The Five Little Peppers and How They Grew” by Margaret Sidney and the “Seven Little Australians” by Ethel Turner. I grew up with “Anne of Green Gables” and “Little Women” and here I fear I must stop because I’ll go on for hours. I was very lucky to have been encouraged to range widely and omnivorously with my reading as a child. What projects are you currently working on? What can we look forward to seeing from you in the near future? I have a lot of half- finished work badgering me to get on with it at the moment! A couple of picture book texts are doing the rounds of publishers, a few stories are on their way to The School Magazine, two middle grade novels are yelling at me for attention right now, phew! I would love to not have to sleep; it would really increase my writing time. I admire those writers who get up at 3 am to write before they start their day and I may yet become one of them when my need to write becomes stronger than my need to sleep, probably in summer. In winter I hibernate a bit. So stay tuned….. Thank you for answering my questions, Ellie! It has been a pleasure getting to know more about you and your work! Thank you for having me :). ‘Lucas and Jack’ (available for purchase here), published by Working Title Press, 2014. Teacher notes available here. Visit Ellie Royce’s website and facebook pages. Visit Alzheimer’s Australia and World Dementia Month Aged Care Online, or World Alzheimer’s Month for more information on this initiative.